alphadog808 was having problems with his Katana Boost build and I noticed one of the cap values was incorrect. I also noticed that I had no motivation to fix it because it was an old pig ugly layout so thought I'd do an updated version and add it as a new thread to keep the versions separated. 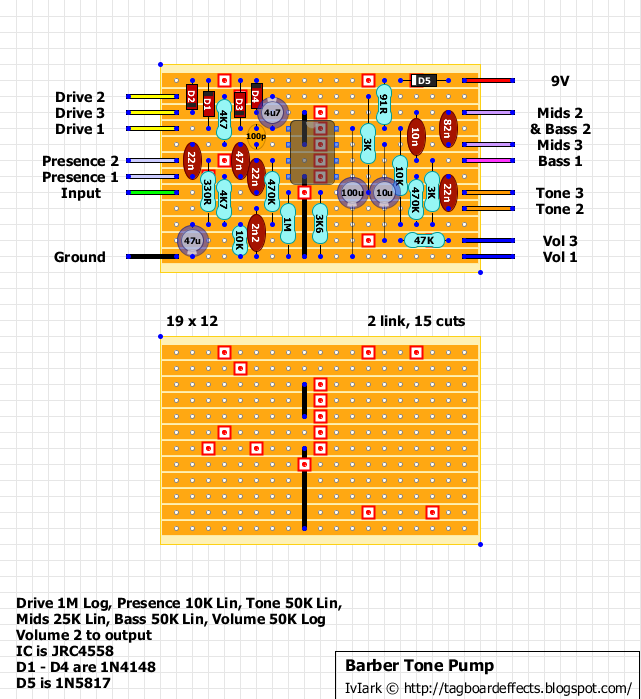 A bit smaller than my last layout and I've also included trimmers to replace the JFETs drain resistors to make it easy to bias and fine tune to your own liking. created to recreate the sound of a guitar playing directly through a 4-track cassette recorder, the Demo Tape will bring you back to your 4-track days. spatty supersaturation and harsh to thick and full, the Demo Tape comes equipped with a two band EQ, volume and trim for simple, versatile and practical tonal shaping. 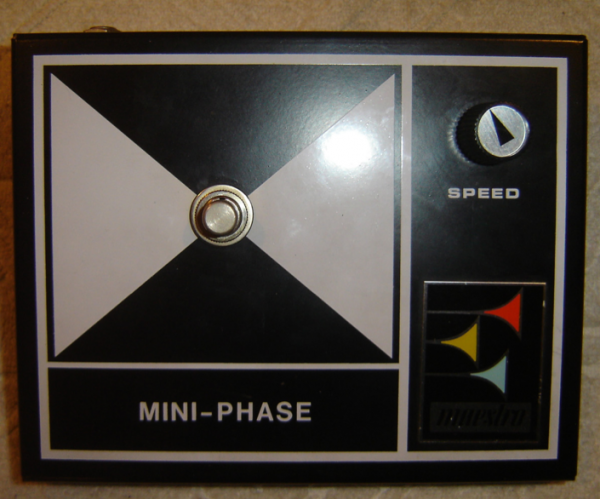 four controls are Bass, Treble, Volume and Trim. 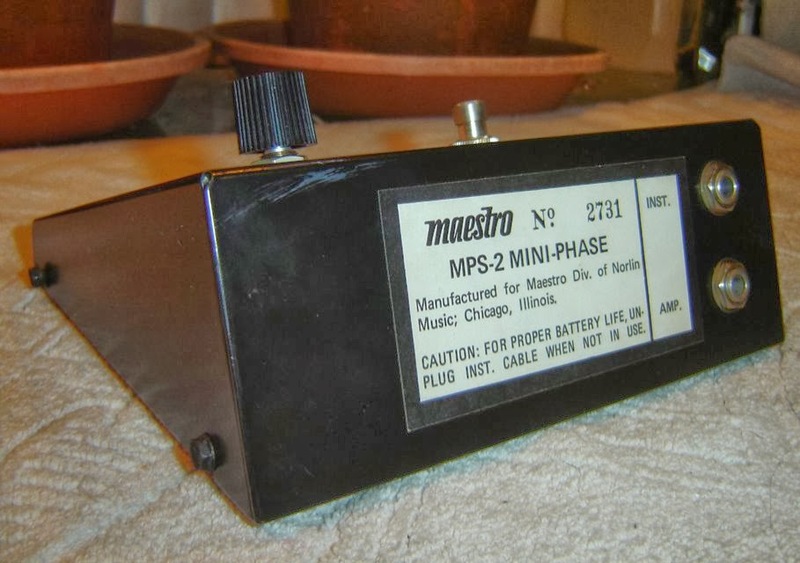 Somewhat similar to a Microamp, but with clever switching which effectively turned the booster into a buffer for bypass mode. I've included an ICL7660S to provide the -9V for the circuit. 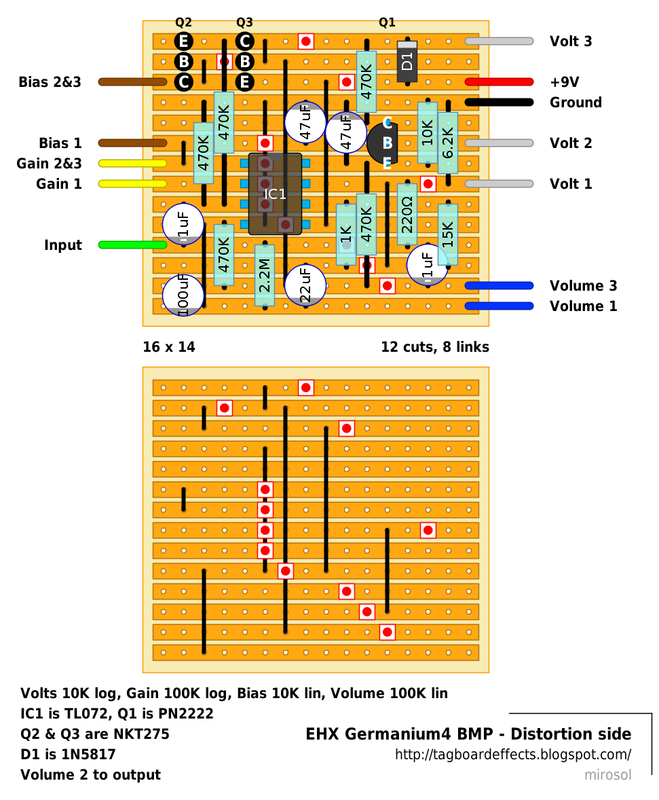 The original also included A/B switching at the output and a simple loop, so I've included a simple A/B wiring configuration on the layout in case anybody fancies including that too. Adapt this with your favourite switching method if you also want to include an A+B option and add a true bypass loop if you want one. Not the most compact layout (as expected with most phasers) but should fit comfortably in a 125B mounted sideways, and maybe even a 1590B if someone has the patience. One thing I will say is that until this is verified I wouldn't recommend it being built by anyone who may not be prepared to do a little tweaking. The effect is slightly different from similar phasers in that it has no resistors between the drain and source of the JFETs and this may be a benefit of the 2N4303 JFETs used in the original. If you substitute these for 2N5952 or similar as mentioned on the layout, then there is a chance that the circuit will need tweaking to get it working as intended. 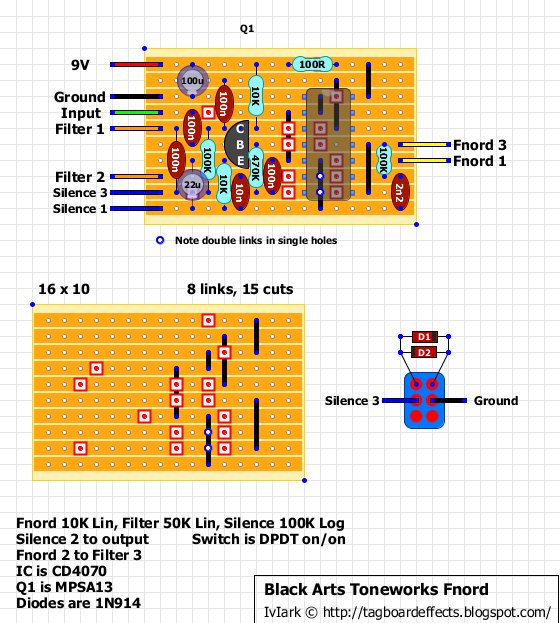 I have left a space to add resistors if necessary just to make this easier to tweak for anyone who would like to give it a go. As usual with these phasers, a matched quad is recommended. 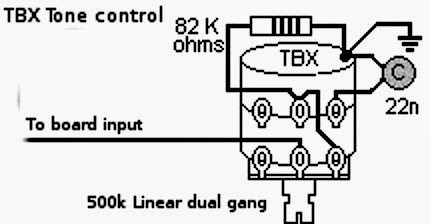 The original BJT transistors were TIS97's which are NPN and around 300 hfe and so I have suggested a 2N3904 or similar as an alternative to those. Maybe a BC547-550 or 2N5088 would get you in the ballpark a bit better than the 2N3904 so I'll leave that selection up to you. The original also used 6 x 741 single opamps and so to save space I have opted for doubles. I'd make sure you socket these as you may want to audition a few to see which double hits the sweet spot for you. One obvious mod recommendation is leaving out the Oscillator Amplitude trimmer (top) and adding an external pot to control the depth. If you do want to do that just take the wires for the pot from the holes on the board that the trimmer is connected. 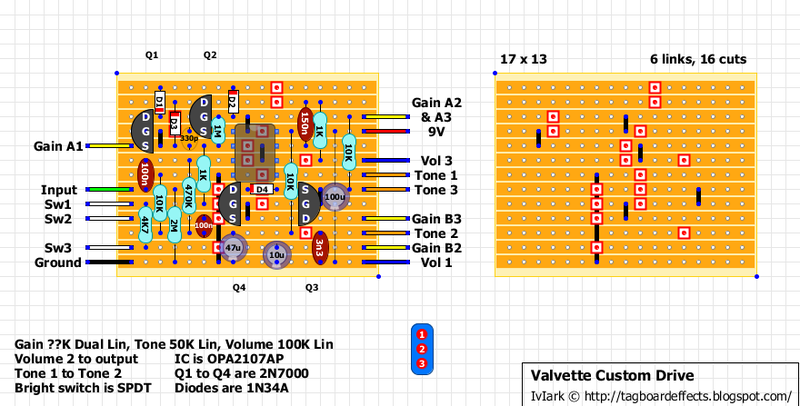 For some reason none of us got my CJ Downbox v2 layout to work. That was a bit of a mystery since the schematic was working correctly on my breadboard, but even though the layout did not have any errors, the flip-flop simply refused to work. I had taken the layout down a long ago and almost forgotten about the whole thing. Until a few nights ago. I was watching some DS9 episodes and skimmed through my ever growing schematics folders. I noticed this one. It's Joe Davisson's Shocktave, dated 2005. This time, as we had one utter failure with the similar design, i decided to build it first and post it if it would work. And what do you know. It works. Low octave fuzz not completely unlike the MXR Bluebox, but with a lot lower parts count. Tracking goes wild very easily, but you can tune the mix control to have quite massive and cool low octave walls with this circuit. Output level doesn't feel luggish, so for all of you who enjoy dirty and noisy low octaves, here you go. Request. 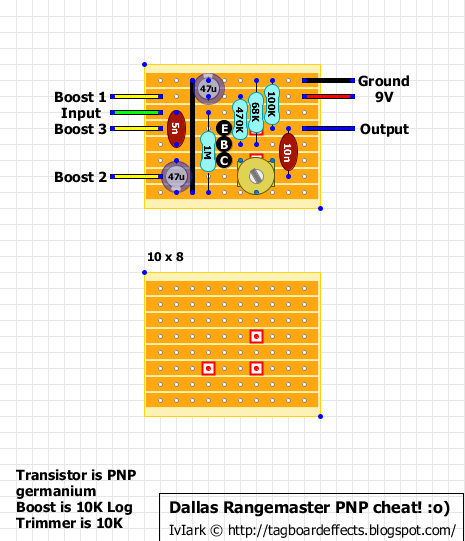 Moving on from the Fourbanger, here's a compact layout for the standard Rangemaster but with a voltage inverter so you can use the better quality PNP transistors but with a negative ground. Note the IC is rotated 180° to how we usually mount it, pin 1 bottom right. To make this a little more versatile I'd be very tempted to lose the input and output caps (and shave off a column) and add a 4P3T rotary switch to swap input and output caps to offer a greater range of frequencies. or whatever suits your taste and equipment. 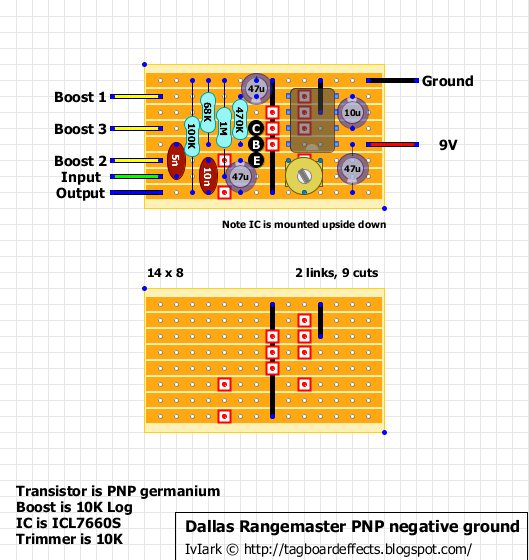 This could well be the ultimate tweakers boost pedal, with a switchable Rangemaster (PNP transistors but negative ground), Super Hard On, Opamp and JFET booster. The one change from his original is that I have included the original SHO circuit instead of his Crackle Not OK version of it. Each booster has its own gain or volume control, and are turned on with a toggle, and then the stomp switch takes the whole lot in and out of circuit. 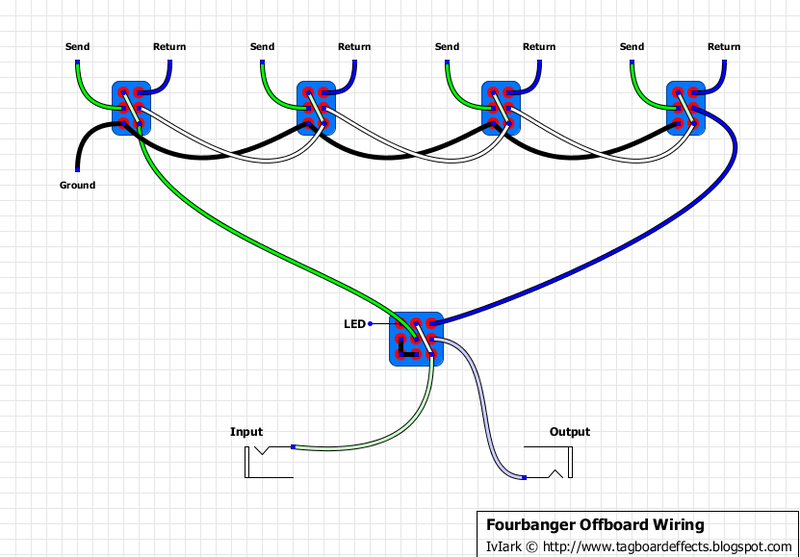 The wiring for each toggle is shown on the layout, and the offboard is essentially like a true bypass looper with the signal going from the stomp switch to the first effects toggle, with the toggle send and return going to the effects inputs and outputs shown on the board. It should be pretty straight forward with one toggle going to the next and then ultimately back to the stomp switch. 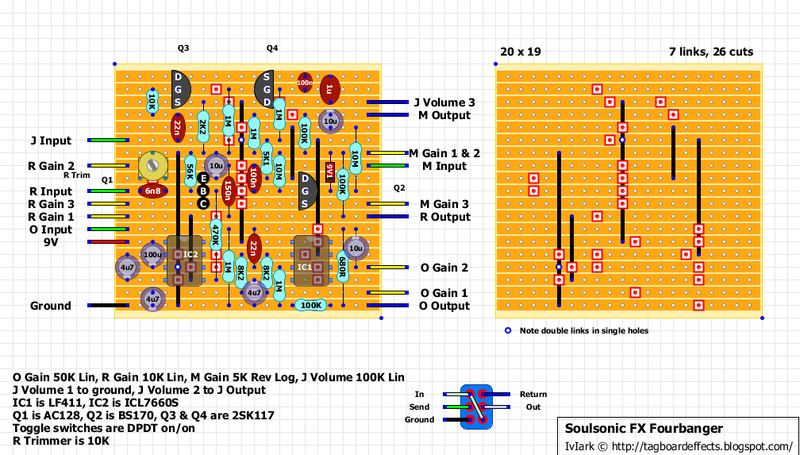 I think the order Martin has the effects is Rangemaster (R), Mosfet (M), Opamp (O) and JFET (J). This is an exciting 4-in-one boost that gives you a choice of four distinct flavors of boost to suit any occasion or style. Pushbutton switches allow you to choose any combination of the four, which allows for many “stacked” sounds that result in a diverse range of overdrive, distortion, and fuzz tones. 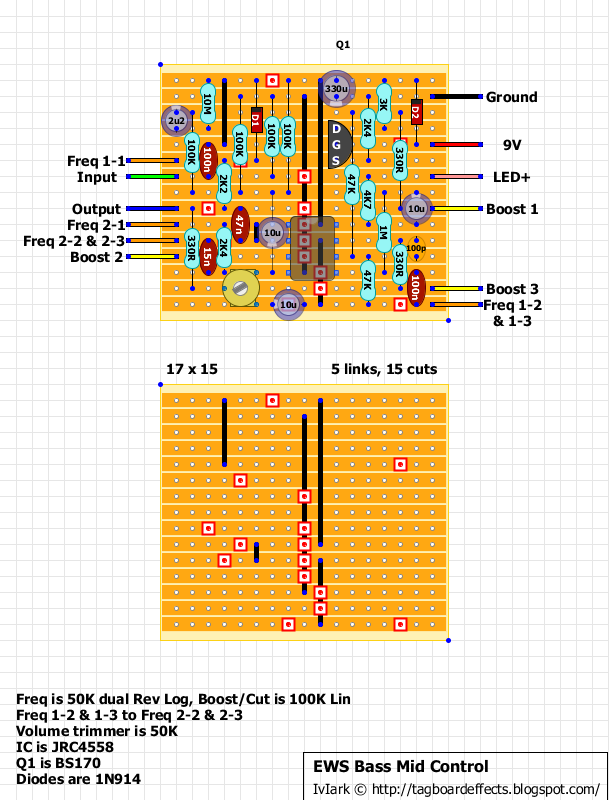 This is where it truly stands apart from other boosts… it’s like a dozen pedals in one! 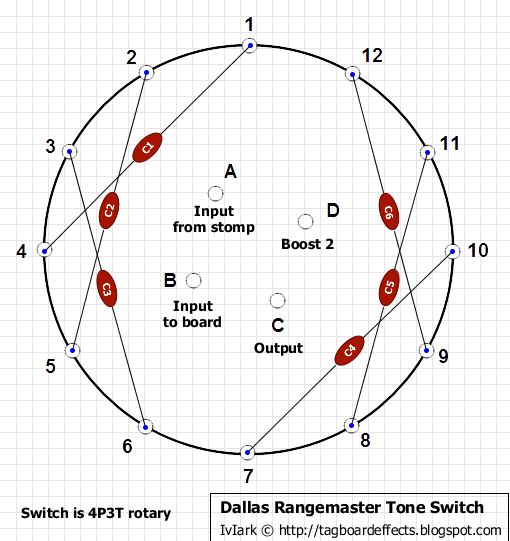 R – Rangemaster – a modern recreation of the classic Rangemaster treble boost. I have painstakingly replicated the signature vowel-peak slightly dirty boost using modern components for lower noise and higher consistency and reliability. 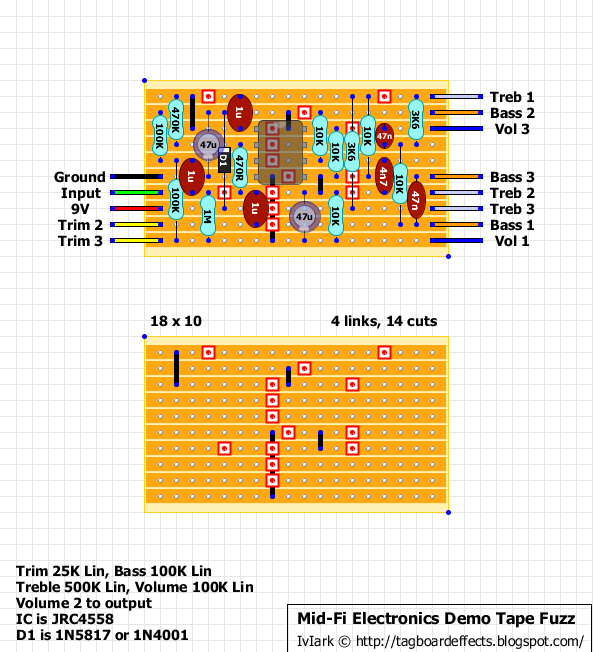 M – MOSFET – my version of a popular boost known for its super hard sound. Not a simple copy, I’ve redesigned the circuit to feature my noise free “non-crackling” gain control and use a lower-noise transistor. The tone is clear and clean at low gain, and loud and fat when turned up. 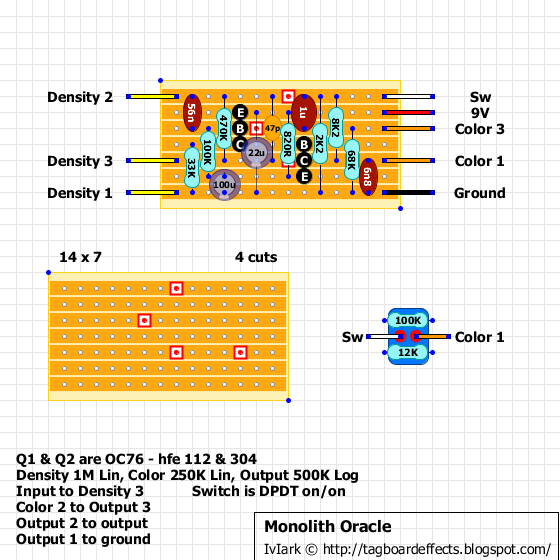 O – Opamp – an original design boost circuit using an opamp. Designed to sound neutral and clean at low gain, but becomes a hot overdrive when turned up. Can be used as a high-quality buffer at minimum gain. 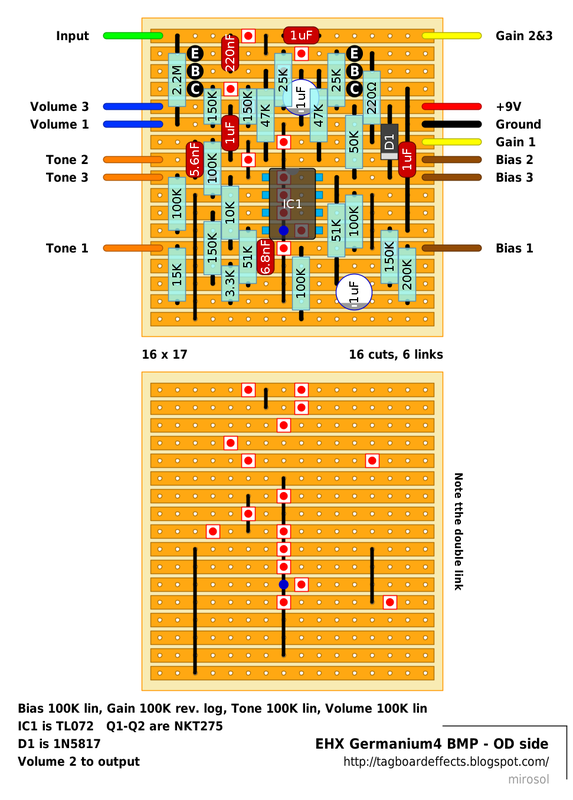 J – JFET – this is a hot boost based on the SRPP topology and utilizing Toshiba 2SK117 JFETs. The sound is an intense boost with a slightly lean low-end. When overdriven by the other boosts, it has a very tube-like character that makes it ideal in the last position. 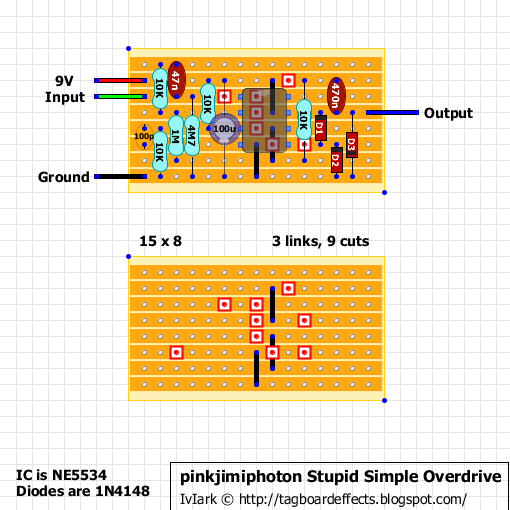 Original version with Crackle Not OK instead of the SHO circuit. Jack uses some fancy clickless switching for this, and as it is PIC controlled it allows him a lot more options so he was able to program a quick double click to enable the Ultra Boost mode. 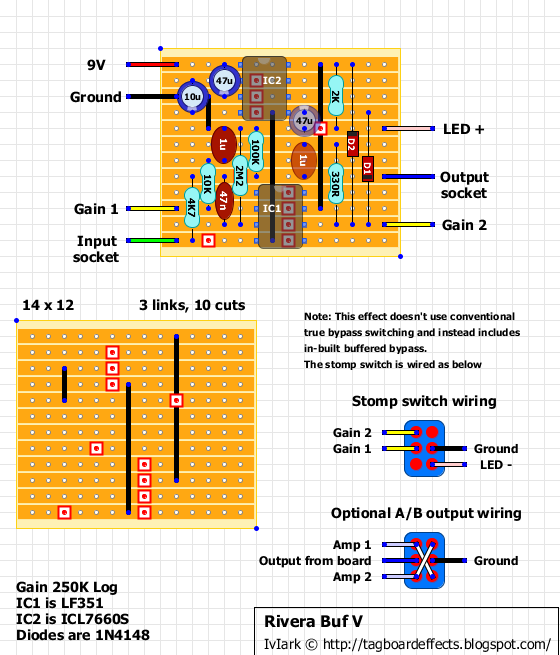 This has been simplified slightly here to use simple true bypass switching, and without the PIC functionality the Ultra Boost mode is turned on with a separate stomp switch, or toggle if you prefer (use DPDT stomp/toggle if you also want LED indication). It has been mentioned that this may be a bit too low gain for some people, although there seemed to be plenty in the vid posted below, but if you want to give it a little more oomph then consider increasing the value of the Gain pot to taste. The original also uses an LT1054 charge pump IC but I have included the ICL7660S instead as it can be obtained more readily, cheaply and will perform the function of providing -9V perfectly well. 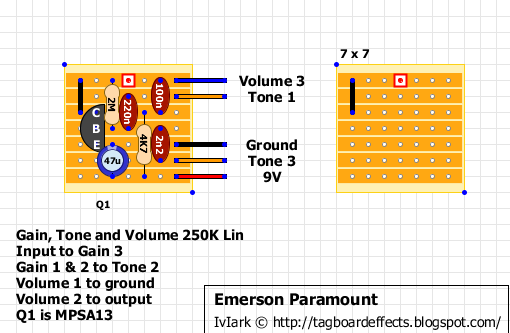 This pedal is currently unavailable, but Jack is a good guy in the DIY community and will always talk about his designs, even correcting schematics and posting his own. 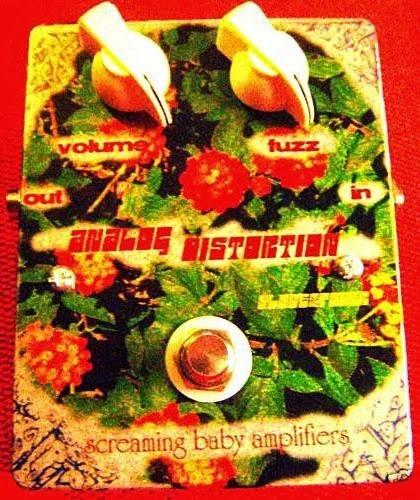 At $149.95 for an extremely well made pedal, consider supporting the builder with this or some of his other effects which also includes Mr Black Effects. 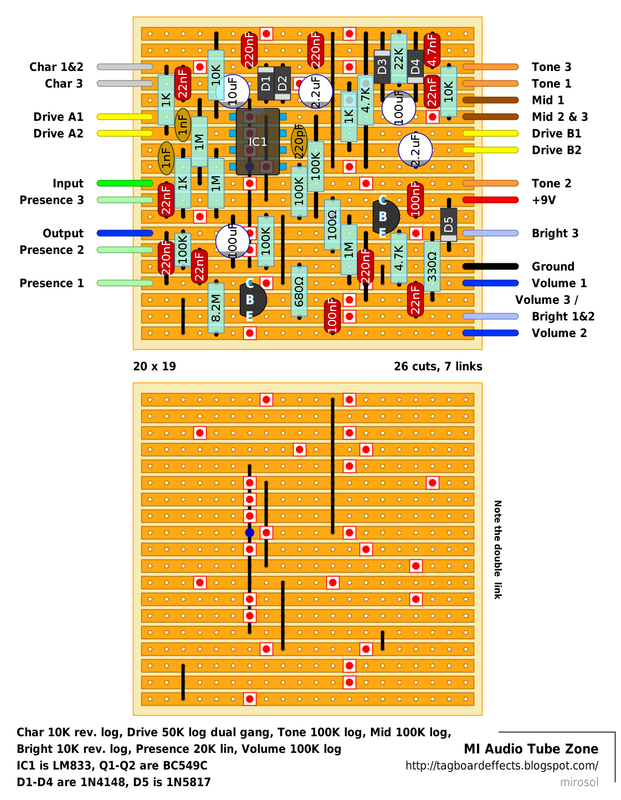 Why do overdrive pedals sound and feel like overdrive pedals? 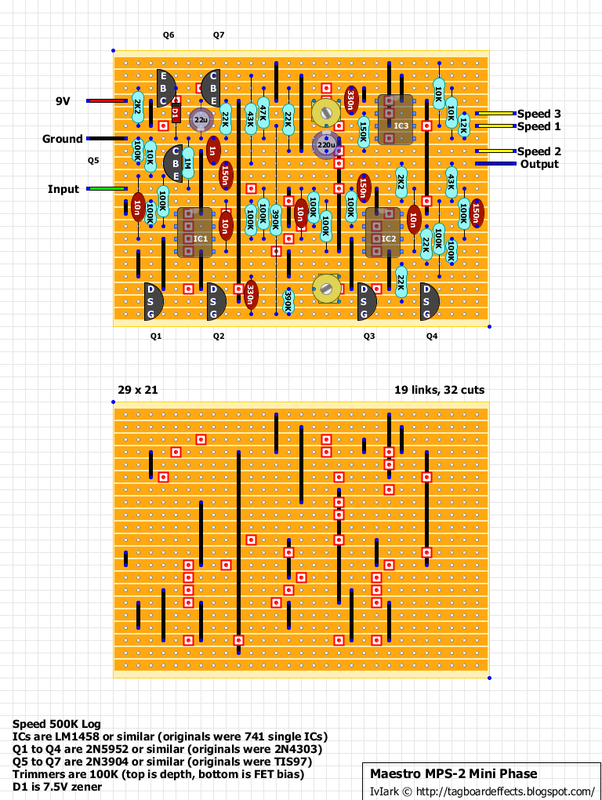 I've struggled with this as long as I've played guitar, so I set out to solve this problem and I designed the Deuce Coupe-- a circuit that felt good, responded like an amp, and made me play things I hadn't before. Revving up clean boost, overdrive and even distortion was extremely satisfying and easy, but there was one last aspect missing: the ability to absolutely pummel the amp on the fly. And then came Ultra-Boost; the clean-up hitter. Included are controls for Volume, Tone, and Gain, with an internal trim-pot for Ultra-Boost level. Deuce Coupe consistently delivers, be the chips up or down, and it does it in spades. Strange. I thought we had this already covered, but apparently not. The layout didn't turn out as compact as i hoped, but there's still some symmetry in there and at 21x15 it will with in 1590B with ease. So this is the original transformerless Octavia that comes in Rocket enclosure. Apparently the last version Mr. Hendrix ever used before he passed on to the greener meadows. 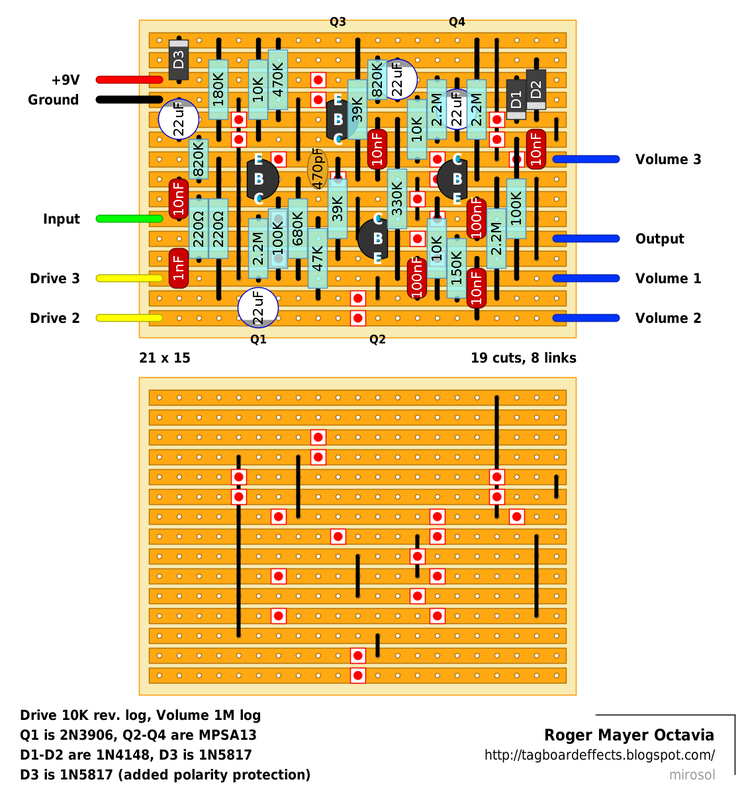 Mr. Mayer has a chronological history of the Octavia/Octavio circuit posted on his site, so read more about it here. Updated 24th March 2018 - misplaced link corrected. Thanks to music6000 for the heads up. 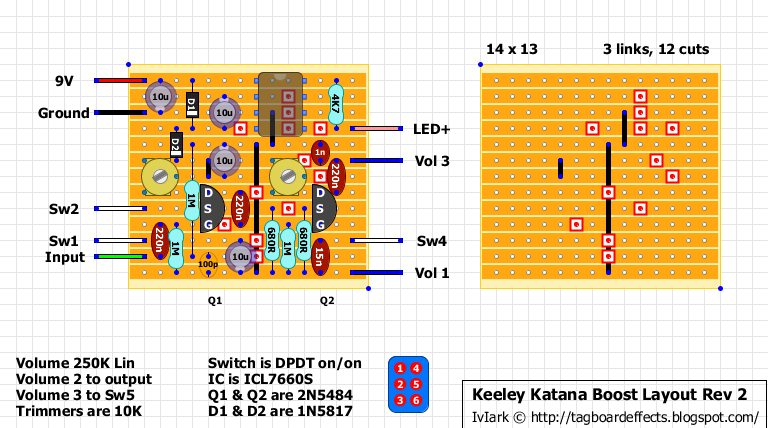 Thanks to YuGi from freestompboxes.org and the fennecelectronics.it forum for the schematic. This is an interesting design and with loads of non standard values just to annoy us! When the Secret-1 Ltd first came out we thought we would never be able to replicate the same circuit in smaller dimensions, but after a lot of dirty job a new little jewel is ready to be played. The most “fighting” overdrive on the market is back in new tight suit and a sound that’s really close to the LTD version. 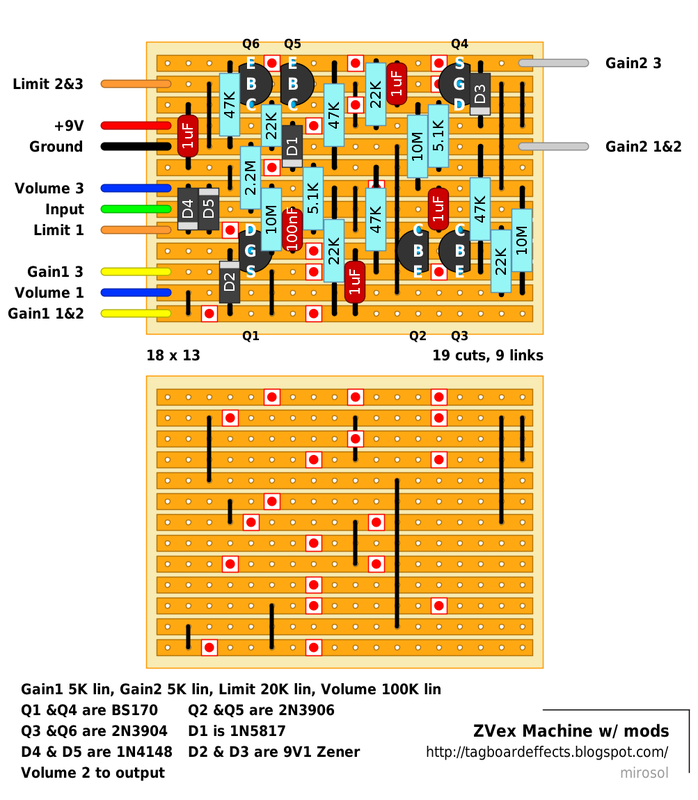 For those who cares about every centimeter of the pedalboard without give up on high quality here it is: the SECRET-1 STANDARD. The Secret-1 STD comes with some new important features, in fact with reduced assemblage times and a more “common” case, we’re able to present the new Secret-1 at a lower price than the LTD version. 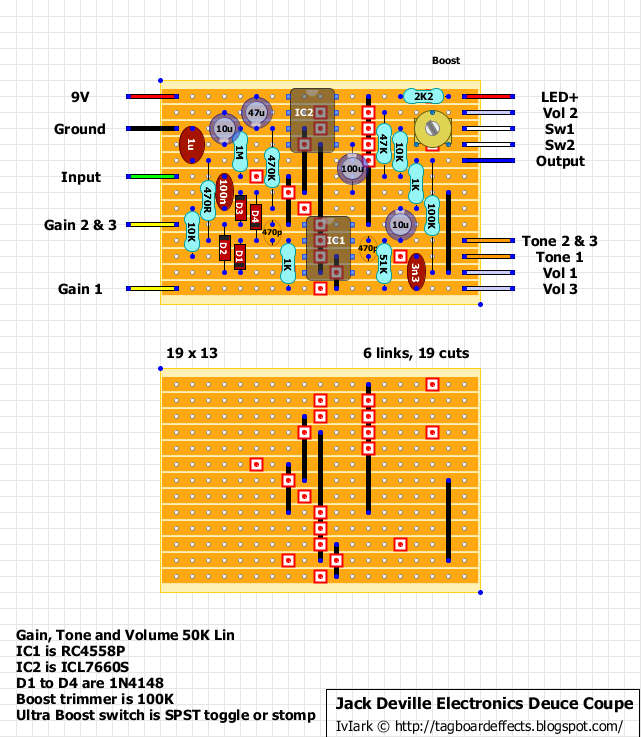 This is a layout for the original Tone Pump but I've changed it slightly so all 6 knobs are external instead of the Presence, Bass and Mids being internal trimmers which would be nice for quick control rather than having to open the box to tweak settings every time. The Tone Pump EQ has a beautiful transparent presentation by which it takes on the characteristics of your guitar and amp without changing their tonal balance. 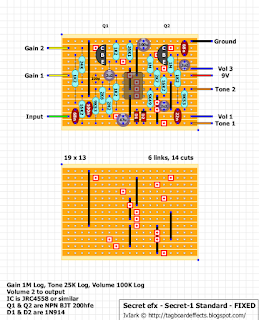 The Tone Pump's gain structure allows flexibility by using two foot switches and separate volume and sustain (pump) controls for each channel. Precision matched components-using proprietary specifications to ensure symmetrical clipping and reduced intermodulation distortion. 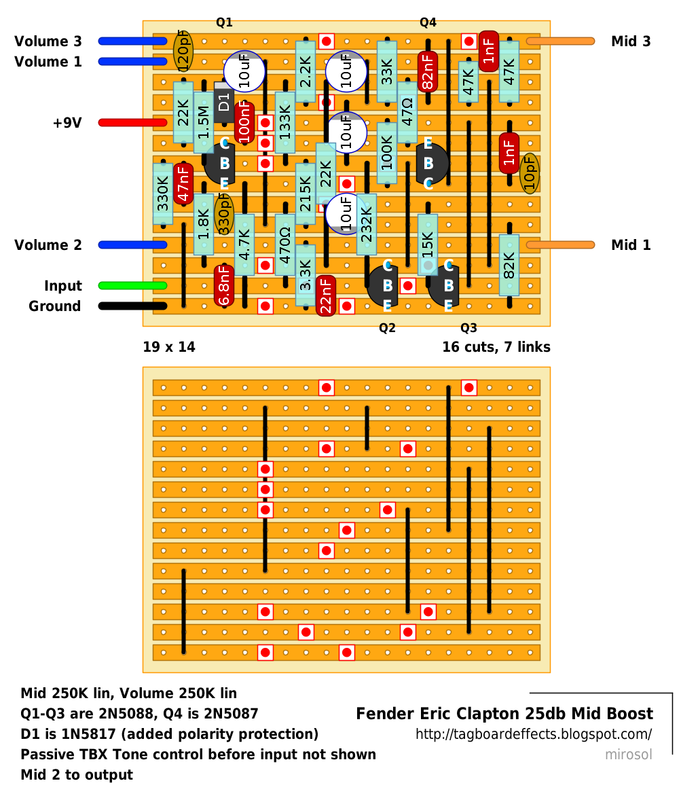 Complex chords are heard with total definition and clarity at any level of overdrive. True bypass switching with led indicator- this is achieved by using a high grade switch, and solid 20 gauge copper hookup wire is used between the jacks and switching to create a transparent bypass. 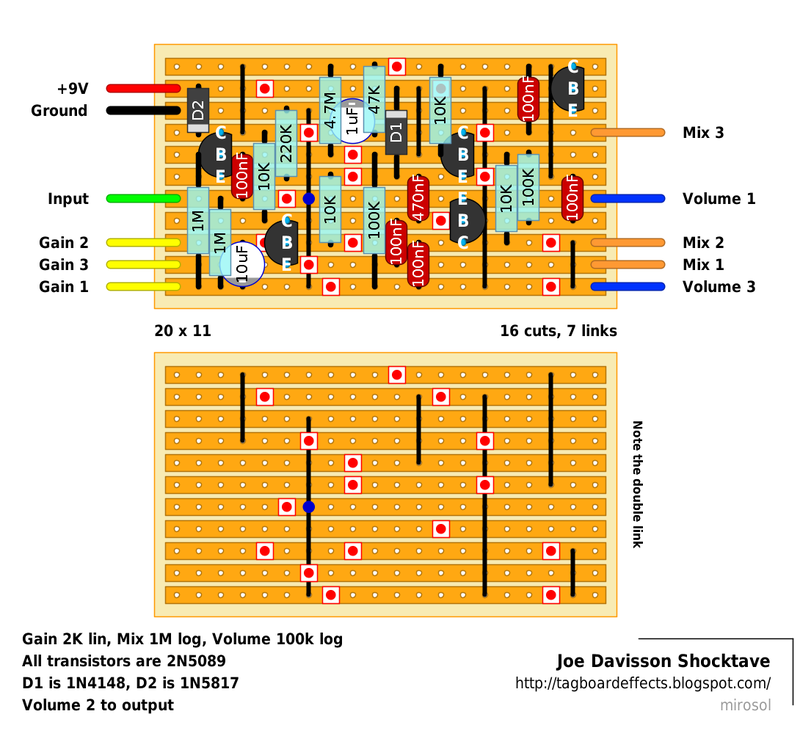 Two levels of overdrive- for distorted rhythm and a second mode for sustaining and thickening lead work. New EQ controls- This great new set of features allows the user to use the new "deep clear" external bass control to properly match the bass response of the Tone Pump EQ to their guitar and amp, this eliminates any low end loss. With the addition of the new presence and midrange controls virtually any tonal response can be achieved, including mids that are reduced, flat or forward, you make the call!...a tweakers dream. 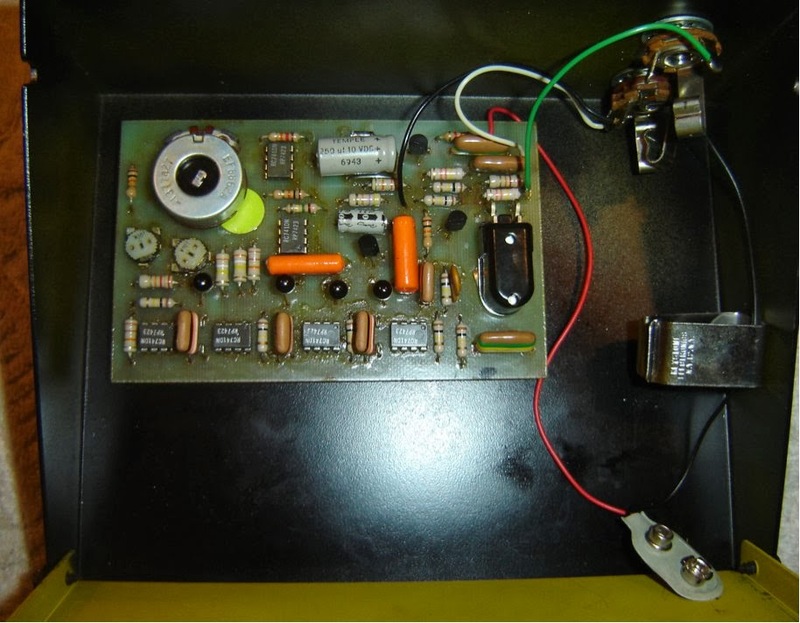 Barber adjustable phono style recovery stage- Most of Barber's op-amp based overdrive pedals use a cool old style phonograph circuit to recover the frequencies lost in the overdrive stage, this worked great for vinyl and now works great for guitar overdrive! 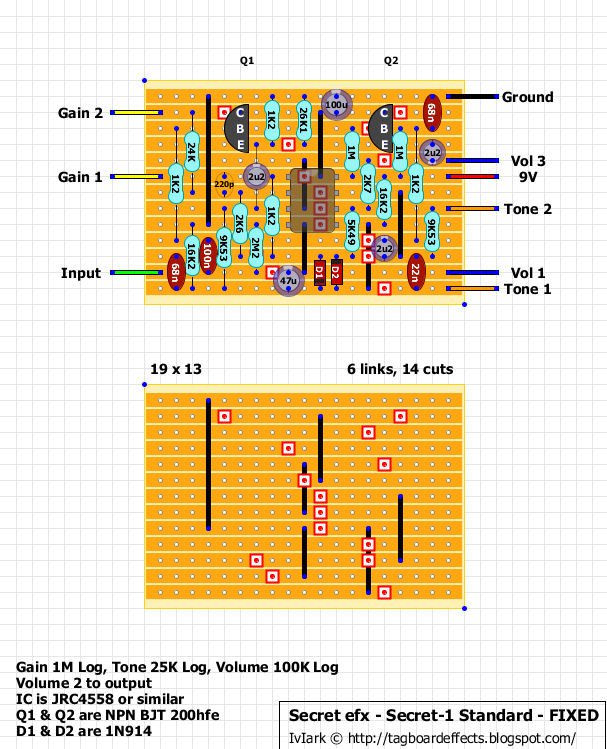 It should be quite easy to make a 2 channel version if you want, using a second stomp to switch between two separate Drive and Volume controls if someone wants an 8 knobber. Well I must admit I wasn't expecting it to be this, a few people may find this amusing though.